“Below are my humble experiences from the last two weeks in the beautiful tropical island called Sri Lanka. The dominant memory coming to my mind is of a real team of spiritual friends, as we travelled together for most of these two weeks. At times we felt like the ‘one for all and all for one’ of the Three Musketeers, or like the Aniruddhas from the Buddhist suttas. Sometimes of course we needed to correct each other, and in one hilarious situation we almost split over two buses each going in opposite directions! “But generally we had a lovely balanced distribution of tasks: Prajnajit as the Master of Mantras and Puja, Saddhavira as the Meditation expert and myself as the humble Dharma study contributor. Which did not prevent us from switching roles at times: Prajnajit was asked to explain quite a lot about Indian Buddhist culture, and on-the-spot we created new Reflection Meditations - e.g. with a Tara-Mara duo. But most special credits for this tour go to our dear friend Prajnajit, who now has proven to have more Sraddha (devotion) than Saddhavira and more Uju-power (uprightness) than Ujukarin! 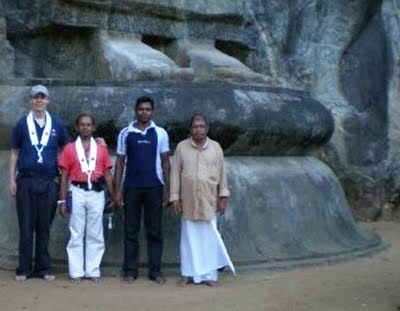 “During the trip we conducted two separate mitra ceremonies, both long awaited; welcome to Chaminda and Devaraj into the mitra sangha! They happened during the more formal activities: two day retreats in our relocated Colombo centre (now in Moratuwa), and a weekend retreat at Sagaraloka, Saddhavira’s retreat centre on the Unawatuna beach. Along with this we did a five-day ‘road trip’ trip all along the island, with journey legs of up to 10 hours - this led to quite a few one-to-one meetings and three talks to larger audiences. “So you might ask, what are the ‘results’ of this? Well that’s always hard to say with Dhammadhuta work, because even a new mitra is not necessarily the result of any effort from the Order  . But we laid plans for quite a few new activities, including corporate Mindfulness trainings. I was especially pleased to see that the negative prejudices against India which many Sri Lankan Buddhists have were proven wrong one by one when they met Prajnajit. Also study and ordination training visits to India by the Sri Lankan mitras are clearly on the rise, especially now that everyone has met an Indian Order Member in person. So again LOTS of thanks to Prajnajit, Saddhavira and all others involved in this wonderful trip! “There’s some more photos on Facebook if anyone's interested.